Kids grow up watching you for a living, and let’s face it, they learn pretty quickly how to push your buttons. It might be back talk, or constant complaining or eye-rolling, but whatever the behavior, nearly every parent will occasionally lose their temper with their kids. Many parents control their emotions most of the time. However, many don’t manage their emotions well, either occasionally or chronically. This article is for parents who struggle with keeping their emotions in check. In this discussion, “losing your temper” is generally defined as: yelling at kids, calling them names, slamming things on the counter, giving bigger consequences than are needed, and refusing to meet basic needs, such as by saying, “No supper tonight.” Power struggles can occur between parents and children over almost anything including, for younger children, bedtime, getting dressed, eating or not eating food, being verbally disrespectful, not responding to rules and limits, doing high-risk behavior such as playing with lighters and matches, or not staying on the sidewalk. With older children, the issues become much more focused on socializing, performing outside of the house, doing chores and assignments, and being dishonest and lying. I want to be clear that when I say “losing your temper,” I don’t mean physical violence. If parents find themselves engaging in aggressive physical behavior when their kids act out, they need help. Let me say this: that help is available. And there’s nothing to be ashamed of in seeking it out. Parents have to take responsibility when they find themselves crossing the line into physical abuse. Power Struggles: Parents often become enmeshed in power struggles with children. No matter what the child’s age, once you’re enmeshed in that power struggle, the more complex your emotions become, and the harder it is to get out. Generally, in the case of a power struggle, parents feel that their power is being tested and challenged by the child. As that happens, parents often try to exert more power to get the child to comply or agree. Of course, the more the parent tries to exert power, the easier it is for the child to win simply by saying “no” or throwing out some excuse. This further frustrates parents until they reach their boiling point—let’s call this their “temper point.” Once parents reach their temper point in these situations, they often lose sight of the original reason why they tried to establish a limit, and they become overly engrossed in “Who’s in charge.” Believe me, many parents out there have found themselves in that situation. Physical Risk: The other situation where parents reach their temper point is when they’re dealing with adolescents and pre-adolescents who are doing things outside of the home which their parents perceive as being too risky or dangerous. This can be physical risk, such as going to bad parts of town, or moral risk, as in engaging in manners of dress, music, and recreation which are against the parent’s values and beliefs. In these cases, parents try to set limits on children who are becoming more and more autonomous. Fears that they will get involved with the wrong crowd, use drugs and alcohol, or put themselves in physical danger can trigger some very heated situations where the child is fighting for what he perceives as his or her rights and freedoms. When kids say “Everybody’s doing it,” what they’re really saying is “I have a right to do it, and you have no right to stop me.” Remember, there is a very simple formula for understanding why teenagers break the rules. That formula goes like this: “That rule is unfair, and if it’s unfair then I don’t have to follow it.” Sadly, you will hear this formula stated in many different ways with teens and pre-teens nowadays. Look at it this way: If losing your temper was effective, being a parent would be really easy. We’d simply have to wait until our child was annoying us too much, then we’d yell at him, and he’d go out and change his behavior. I’ve often told parents in my office, “If yelling worked, I would just simply call the kids into my office and yell at them and they’d go home and have a good week.” In fact, if yelling worked, they never would have been in my office in the first place. But losing your temper doesn’t work. Losing your temper is ineffective because the original problem is often forgotten in the heat of the argument, and goes unsolved after all is said and done. Instead of the child learning problem-solving skills from the parent to manage the particular issue at hand, those problem-solving skills get supplanted with the parent’s power thrusts toward the kids. This is not to say that using power is bad or immoral. It’s simply ineffective if the child doesn’t learn problem-solving skills. Simply put, if parents have problems with their child’s behavior and all they have in their parental tool kit are bigger hammers, the kids are going to develop bigger nails. The day will come when that parent will not be able to manage their child by losing their temper. It must be understood that learning how to solve problems and manage emotions is the primary task of childhood. And if the parent isn’t teaching that, it’s hard for someone outside of the home, whether it be a therapist, counselor or teacher, to pick up those pieces effectively. If you have a “hot temper,” get help. If you have a consistently hard time controlling your temper, or you find that anger manifests itself frequently, you can use the points in this article as a guideline for how to deal with your kids, but you have to take responsibility very quickly on getting the help you need. The word “hot temper” is code we use for people who are intolerant and can’t handle any kind of challenge or anxiety. This often is caused by issues other than child-raising, whether it’s stress from work, finances, relationship difficulties, or a parent’s own childhood experiences. Parents are responsible to get the outside help they need so that they can manage their kids appropriately. Taking things personally means viewing that child’s behavior as a total reflection of your character, skills and worthiness as a parent. You often see this when kids act out in grocery stores or at the mall, and parents feel embarrassed and judged by others. There are two fallacies here: one is the belief that the other parents are judging you critically instead of feeling empathy for you because of their own experiences with their children. The other fallacy is to believe that their judgment matters, because it doesn’t. What matters is that you deal with your child effectively when he acts out in public. And if you don’t have the skills to do that, you make it your responsibility to get them. So the effective parent is not the one who never loses their temper; he or she is the one who finds a way to do something about it. Parents who experienced a lot of criticism and frustration in their own childhoods are more likely to see condemnation and disapproval in the eyes of others and react in an ineffective way. In those situations, where parents do not manage emotions effectively, the problems can escalate into a power struggle, which is something we really want to avoid with kids, especially in public. Parents who take things personally often have a mindset that it’s not right or it’s not fair that their child should want to buy a toy or get distracted or not follow directions. That thinking just adds fuel to the fire of personalization. Know this with younger children: Whatever it is they’re doing, they’re usually not doing it to you. The more able you are not to project sinister motives into your child, the more objective you will be able to remain. The fact that you feel embarrassed by your child’s behavior does not mean in any way, shape, or form that your child is trying to embarrass you. Your child is either over-stimulated or distracted by something that’s not on your agenda. Sometimes children become locked in a power struggle that they don’t know how to resolve and don’t know how to stop. Remember, the time to teach them how to avoid power struggles is when you’re not in one. When a parent gets locked in a power struggle with a child of any age, the parent is the one that needs to have sufficient skills to avoid and manage it. There are two things that I think parents can do that will help them a lot when it comes to managing their emotions. The first is to plan ahead, and the second is to have a bail-out plan. Parents needs to plan for situations where they think their buttons are going to be pushed. Those situations are pretty easy to figure out if you just sit down and write yourself a list. First, write down situations and places outside of the home that are problematic. Examples might be going food shopping, going to the mall, or going to restaurants. You probably know ahead of time that you might have problems managing your emotions in reaction to your child’s behavior during those trips. Let’s face it, it’s easier to figure out what you’ll do when you’re calm and sitting in your kitchen than when you’re in aisle 3 of the local supermarket. If your child does something in particular that aggravates you, plan on what your response will be. This is easy because you don’t have that many options to begin with. You could inform your child that you’ll give him one warning and then you’ll both be leaving the store if he misbehaves. You can plan on going to your car until your child calms down and you think they’re ready to try again. While you’re in your car, you can talk to your child about what they can do differently when they don’t get their way again after you go back into the store. If your child doesn’t calm down in the car, or if calming down in the car has not worked in the past, then you have to go home. After you go home, you can try it again later that day or the next day. In many cases, your child will learn how to handle these situations, but they won’t do it while they’re in the store. When children are in stores, malls or at playgrounds, it’s easy for them to become over-stimulated. Once that happens, it’s almost impossible for them to respond to outside direction unless it is very clear and powerful. : Plan how to bail out of conflicts when your buttons are pushed, so that you don’t lose your temper. For instance, if you’re going to talk to your child about something anxiety-provoking or emotional, be prepared for when that child doesn’t react the way you want them to. Already know in your mind what you’re going to say or do. There are two ways to go about this: one is to calmly say to your child, “I have to talk to you about something important, I’ll be up to your room in about 15 minutes and I don’t want to argue or fight.” This gives your child time to prepare for the discussion. Also, during that time, you can decide what you’re going to do if your child starts to argue. The most obvious thing is to tell the child, “I don’t want to be talked to this way. I don’t like it,” and then leave the room. You can also say, “We can try to talk about this at 6 o’clock, until then, no cell phone, video game or TV.” Parents who are mentally prepared for how they’re going to act when children react have a much greater chance of not losing their temper. Acknowledge to your child that you’ve lost your temper, but not in overly emotional terms. Just as we want to teach children to own their behavior without a lot of justifications and excuses, so should we model that behavior for them. I think the best thing to do is admit you were wrong and explain to your child what you’ll do differently next time they act that way instead of losing your temper. But work out with yourself what you’ll do differently the next time you’re at the point of losing your temper. Also, I believe parents should have a support group they can talk to if they find themselves losing control of their temper often. I say “group” but it may only be one or two people with whom you can share about how you’ve lost your temper with your kids. It is very helpful to have somebody outside of your family, preferably with children of their own, to talk to about the day-to-day parental situations which occur. If you don’t have that in your life, the parent coaching for the Total Transformation® Program can really help with these types of situations. When we’re talking about parents calming down, we’re talking about them “self-soothing.” In other words, they soothe themselves by managing their own thoughts, not by controlling the environment around them. So when your child is challenging your authority, what you are thinking will be critical to how you will respond. If you’re thinking, “This behavior isn’t fair, everybody thinks I’m a failed parent, other parents don’t go through this,” or are repeating some other self-defeating self-talk, things are sure to escalate. But when you’re thinking, “I can handle this, this is a child misbehaving, not a reflection of my parenting skills, other parents go through this, what can I do safely about this now,” there’s a much better chance that there won’t be a conflict. Remember, advice such as “Count to ten” only works if you try to think positively while you’re counting to ten. So if you’re counting to ten saying, “Don’t overreact, this is just childish behavior, how can I best handle this, what does the child need from me now,” there’s a good chance counting to ten will work. 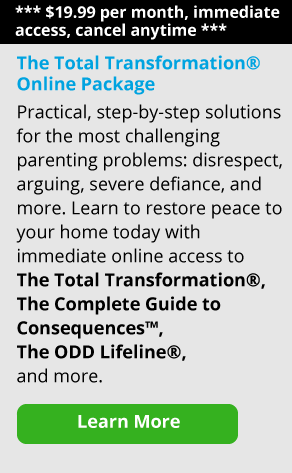 Similarly, if you have a conflict with your child at home and you go into another room and take ten deep breaths—that’s a seven second inhale, seven second hold your breath, seven second exhale—and you think positively while you’re doing that, like “How can I best handle that situation, how important is this to me, how can I make this work without fighting,” you’ll have a much better chance of resolving this situation effectively. Whatever’s going on, whatever your child is doing, losing your temper won’t help. It may feel good in the short term, because you feel powerful, but in the long run the child has learned an ineffective lesson about managing anxiety or conflict.